Oil-Electric: "Get Your Tracks out of Town!" 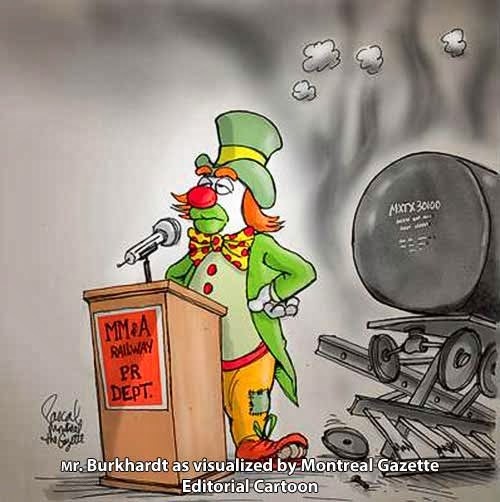 Lac-Mégantic Mayor to Railway: "Get Your Tracks out of Town!" 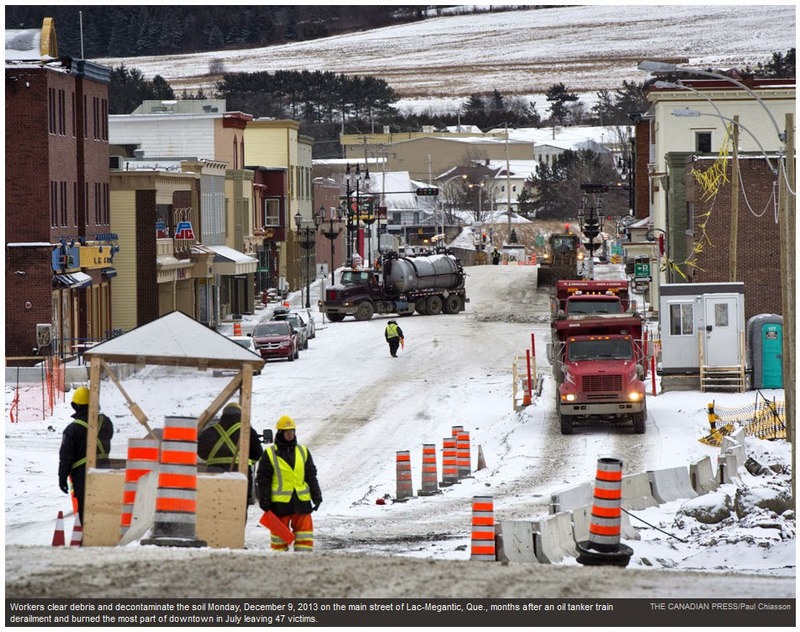 Lac-Mégantic is still recovering from a fiery train disaster last July , when a Montreal, Maine & Atlantic runaway train devastated the bucolic lakeside town. 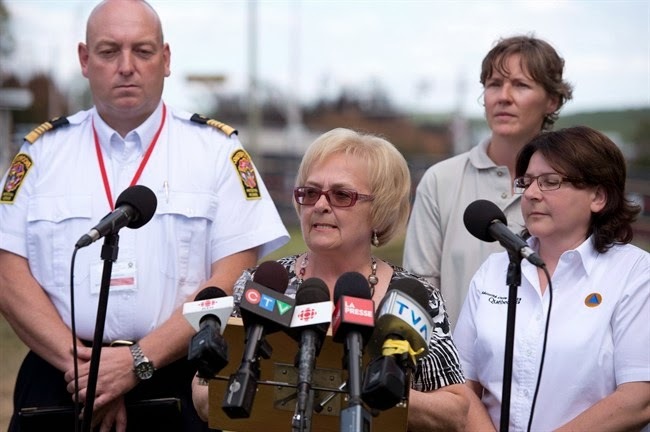 Mayor Colette Roy-Laroche says she made it clear to the railroads new owner that she - and the residents of Lac-Mégantic - want the tracks out of town! 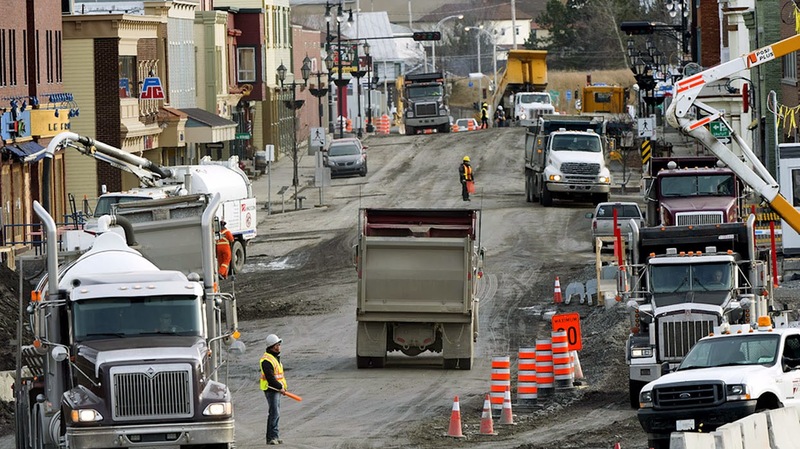 A Lac-Megantic town official says Mayor Colette Roy-Laroche delivered the message this past week during her first meeting with a representative for Fortress Investment Group, the winning bidder for the insolvent Montreal, Maine & Atlantic Railway. 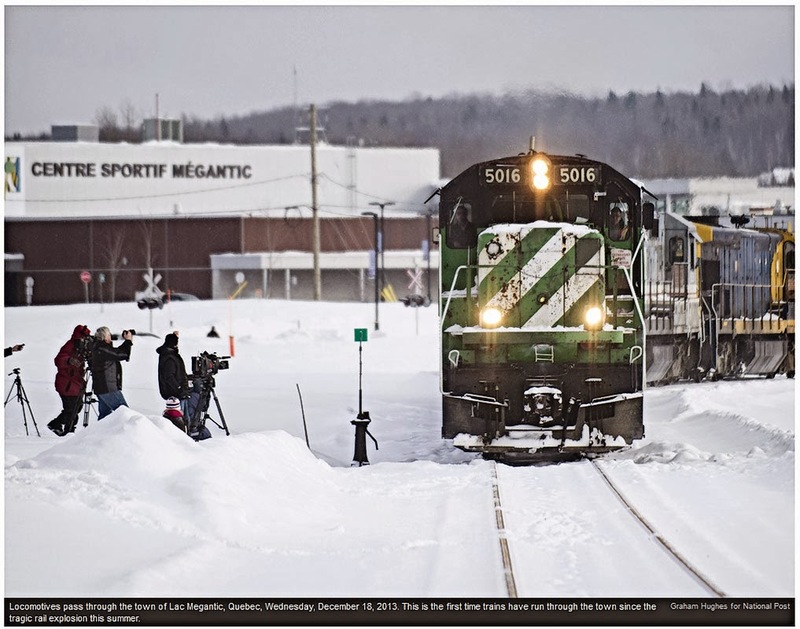 The Lac-Mégantic official says the mayor also made it clear during her "positive'' exchange with Fortress consultant John Giles on Monday [February 24] that locals no longer want crude oil transported through the middle of the community! Former Montreal, Maine & Atlantic, former BN 5016, tip toes past a gathering of news media. I am sure the locomotive operator was feeling uncomfortable, knowing the residents are not at all pleased to see a train in town. 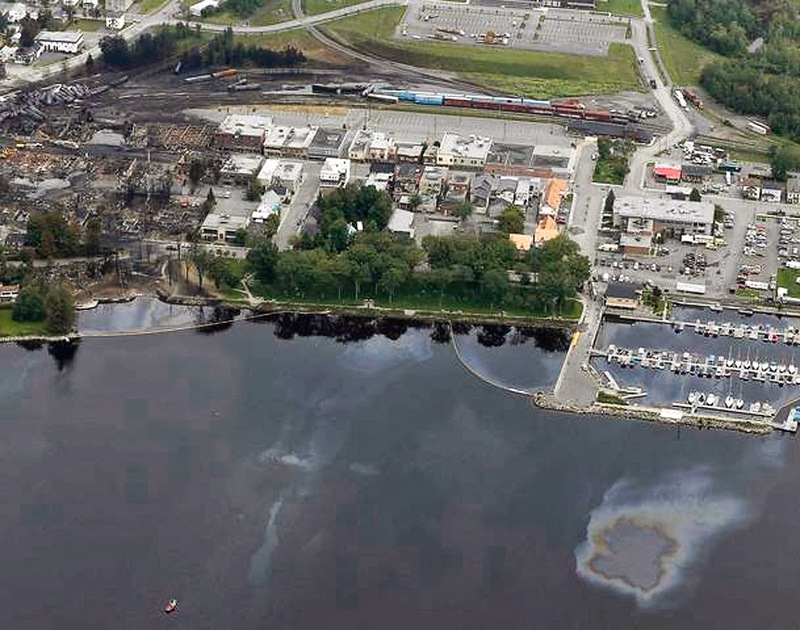 • Spilled 1,300,000 US gallons (5,600,000 litres). • Covered 32 acres (31 hectares). 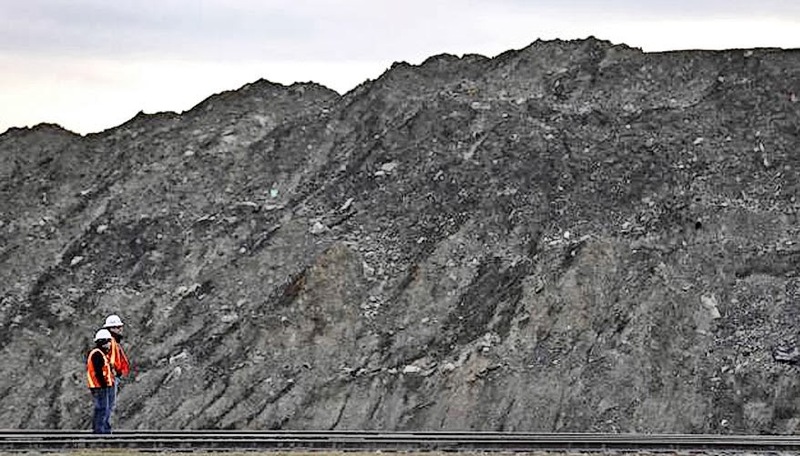 • Contaminating 558,000T (506,209t) of soil. • Impacting the flora and fauna. 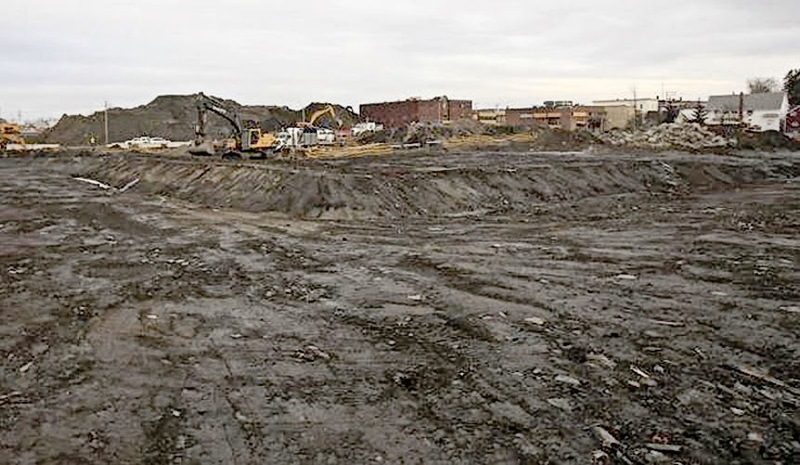 Every last teaspoon of soil - 558,000T (506,209t) - needs to be removed for remediation, or remediated "place." 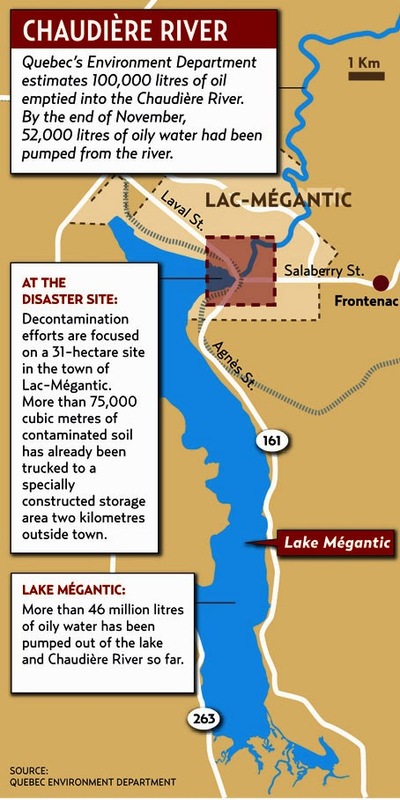 Here is a detailed assessment of the what needs to be done to reclaim Lac-Mégantic. This isn't a "lab experiment." This is a real town, with real people. Too often we look at photos like these with a sense of detachment. I want you to look at these photos, and think about how you would feel if this was YourTown USA. Personal vehicles and land - gone! None of this would have happened if Edward Burkhardt had not taken over this road, and run it into the ground with his preposterous notion that one man can run a train! • 47 people would be alive. • 40 structures would be standing. • 160 structures would be functioning. 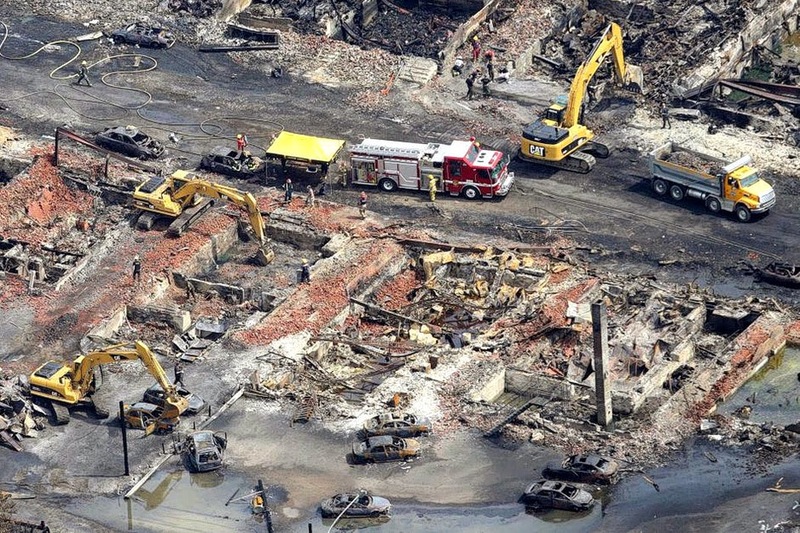 Following the train disaster in Lac-Mégantic on July 6, 2013, the International Charter on Space and Major Disasters was activated by Public Safety Canada, to assess the scope of the disaster. QuickBird-2, the worlds highest resolution satellite camera, captured these "before" and "after" views of Lac-Mégantic. Click on each image to experience the high resolution of QuickBird-2's camera. 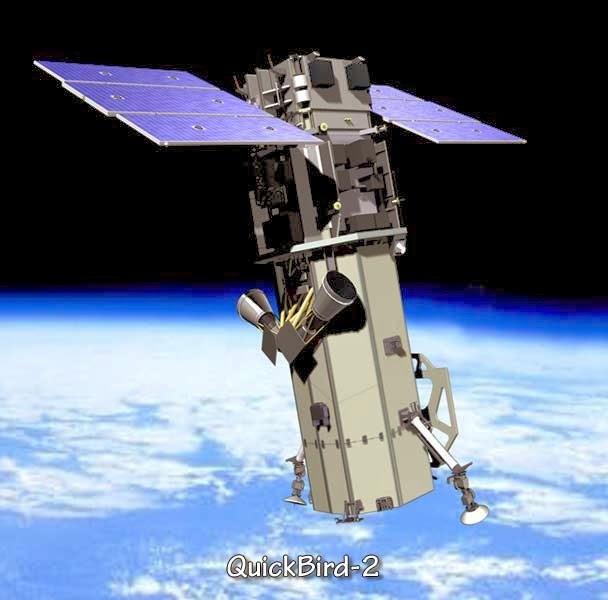 QuickBird-2, owned and operated by DigitalGlobe, Longmont Colorado, launched into its 280 mile (450 km) orbit from Vandenberg AFB aboard a Delta II vehicle, in 2001. 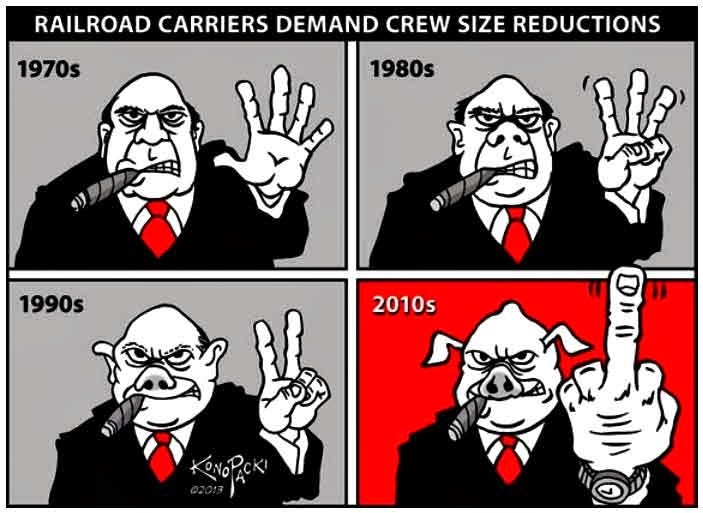 2014 is anticipated to be the final year of operation, due to its deteriorating orbit. Here is an interesting "primer" on satellite imaging. Google Earth now shows Lac-Mégantic after the wreck, taken July 12, 2013. Type Lac-Mégantic into Blog Search Engine in right column, to access all articles pertaining to this disaster.